What exactly is bullying? It is classified as repeated, harmful treatment that is costly to all of the people involved; bullying typically includes verbal abuse and threatening actions. In the workplace, bullying is slightly different, as more factors come into play. Bullying is not interpersonal conflict. (Conflict and bullying are two entirely different situations that arise). Bullying is also not harassment and does not mean creating a hostile work environment. Aggressive communication (anger, yelling, insults, etc). Acts aimed at humiliation (purposely embarrassing other employees). Targets are usually bullied for 6 months – 5 years. (On average the target usually leaves after two years). Bullying at work can create a wide variety of issues for the people who are involved. Instances of depression, anxiety, and absenteeism tend to rise. Components such as work quality, loyalty, customer satisfaction, communication, and ability to meet goals tend to decrease. Overall, bullying can greatly impact a work force and the ability of workers to successfully complete their job. Targets should document facts about what is happening to them at work. They should approach their supervisor and/or human resource department with these facts and try to end the bullying. 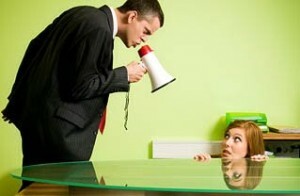 It is important to take these grievances seriously and strive to end bullying in the workplace. Bullying is something that should not be able to make its way into any workplace environment. However, if it does, it should be acknowledged and treated seriously to ensure that people do not resent coming to work every day. It is also important to note that a happy employee generally helps to create a pleasant work environment and a more successful business.